By the time most of you read this I’ll be on my way to sunny San Diego, CA to visit one of my best friends! This will be my first time flying with Miss E by myself and I’m a little nervous about it, so say a prayer for me! But all in all, I’m really excited to have some girl time and put my toes in the sand! On another note, I’ve picked all of the giveaway winners from the Blogiversary Celebration so please check your emails! Now onto a sweet and inexpensive project for the day. 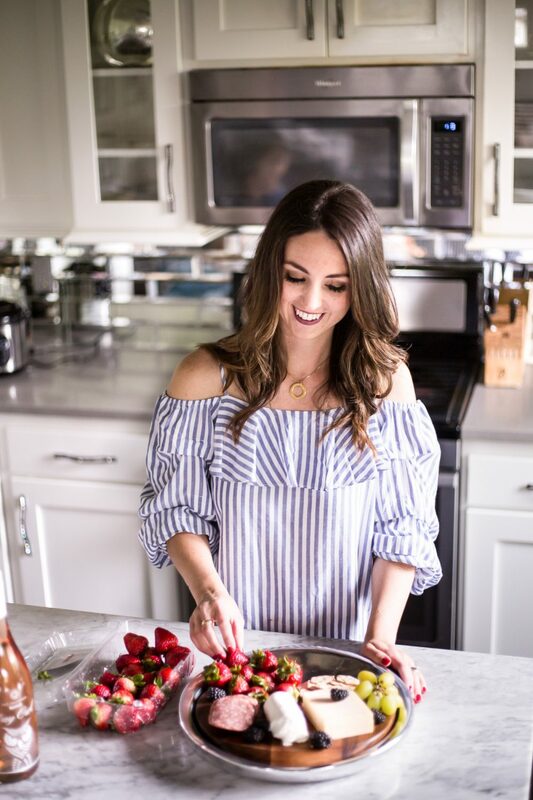 If you are looking for a simple yet elegant centerpiece idea for your upcoming dinner party, wedding, or rehearsal dinner, I’ve got an idea for you! 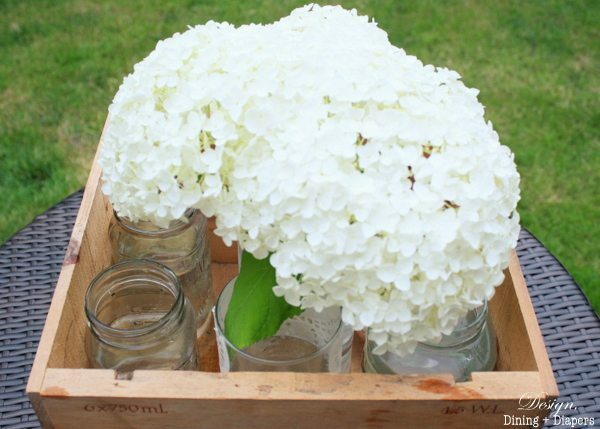 Using an old crate, mason jars and some hydrangeas from the garden you can create a chic floral arrangement for hardly anything at all. 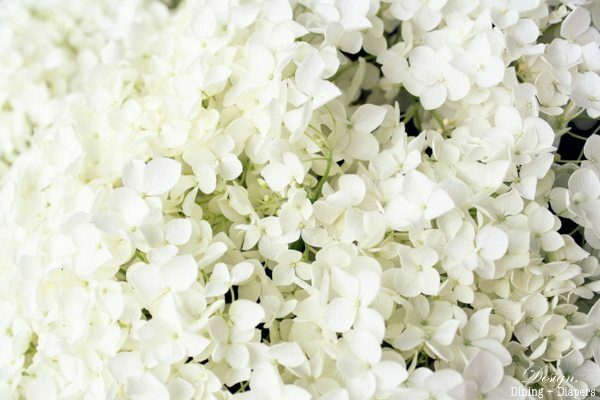 I love flowers and I am so fortunate that I have gorgeous white hydrangeas that fill my back yard every summer. I’d like to take credit for how gorgeous they look but in reality they are pretty low maintenance. I planted them about 3 years ago and every year they get bigger and more beautiful. Starting in mid-July and through September hydrangeas fill every room in my house. Love. I generally just use simple glass vases for my arrangements, but this year I decided to use this old Wine Crate that my grandma gave me (you can read more about that here). Here are a few little tips on how to get a full and tiered flower arrangement. I started with the old wine crate and gave it a good cleaning. 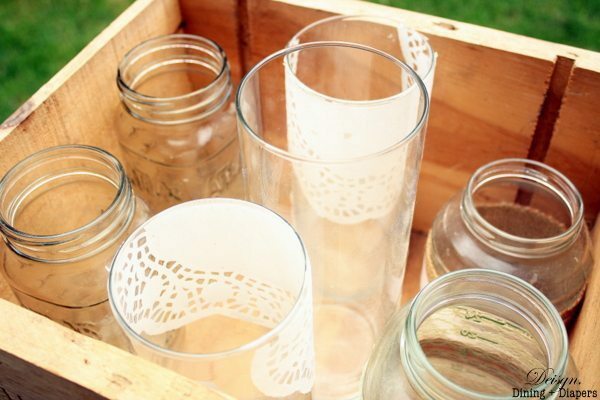 Next, I gathered some mason jars and old vases and placed them inside the crate. Now here is my tip. Place the taller vases in the center to give the arrangement some height and then place the shorter vases around the edges. This will help the arrangement have a fuller/rounder appearance and stay symmetrical. 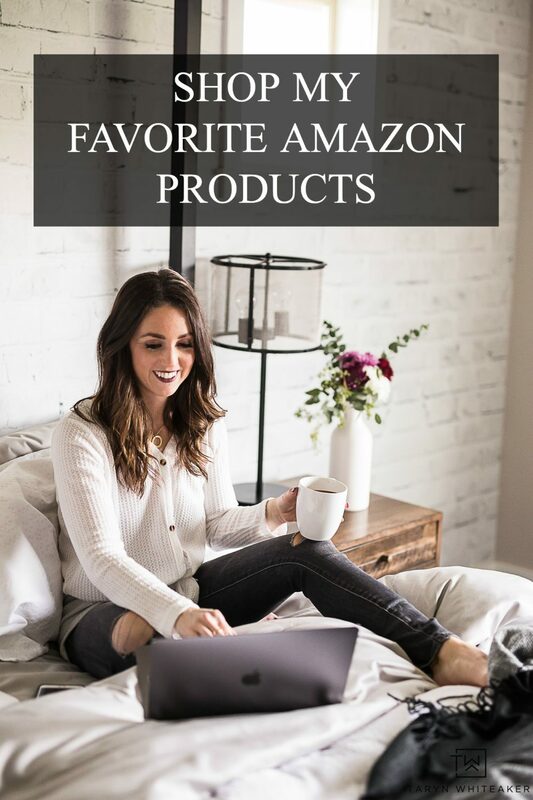 I’m checking out for the rest of the week and weekend but I have a great guest post for you tomorrow! I love hydrangeas! I have blue and purple ones in the yard and love this time of year because of having them in the house. Stop. It. This is gorgeous! Have fun in San Diego! Oh it’s gorgeous! 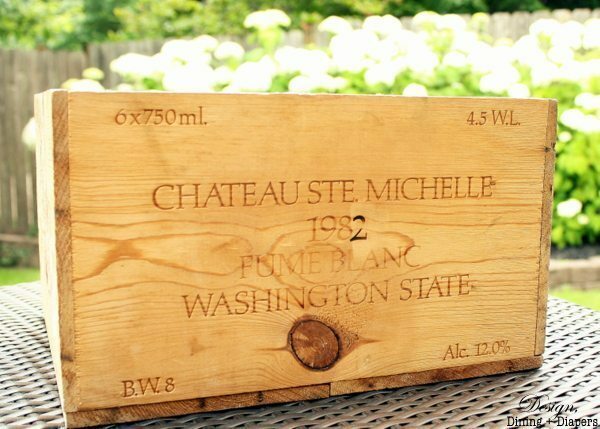 Love it, I have been wanting to pick up some wine crates. I hope to someday have some as beautiful as yours!! Sooooo soooo pretty! 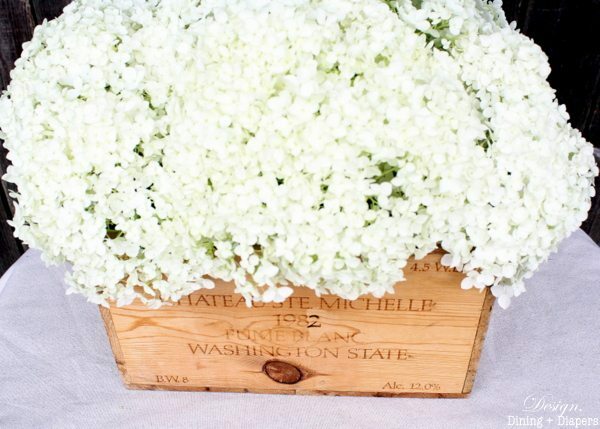 I love the white hydrangeas. I tried some here early in the spring but the Texas summer killed them. The rustic box just adds the perfect touch. Classic and elegant! Love it! awesome idea! Would love to have you link up to our party! Okay, this is just so stinking gorgeous. LOVE IT. Believe it or not, I have actually toured that winery! I still have pot holders from the gift shop. 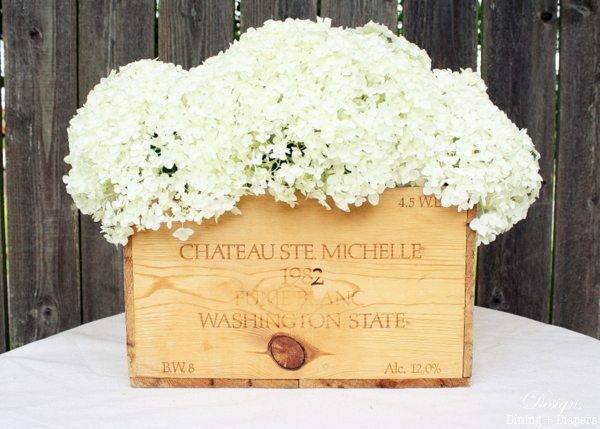 I just love the hydrangeas against the rustic crate…..beautiful! Hi Taryn, found this on Live.Laugh.Rowe so great! Love it!! I love this! 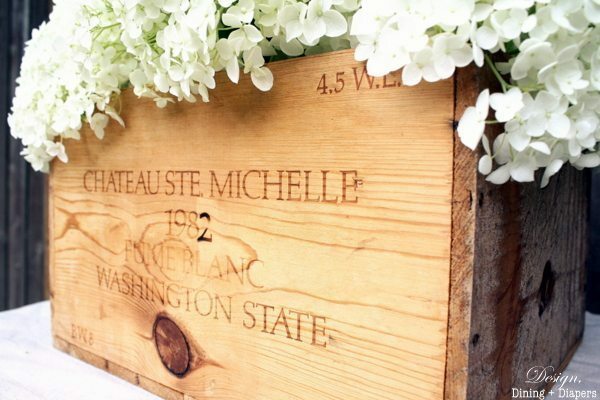 Such a great idea and perfect balance of elegant and rustic! What a lovely and simple idea! Thanks for sharing it. So beautiful! One of my favorite flowers! Gorgeous centerpiece. Thanks so very much for sharing! What a fantastic idea! This is absolutely gorgeous and yet so simple to do! Absolutely beee-youtiful! Featuring you, Taryn! This looks lovely! I have the same type of hydrangea. I’ll have to keep this in my mind for next year when they bloom again!